0700 MrJ and I leave Ron’s Anchorage to go upstream. It only took us an hour to be anchored again not too far from the main King George Fall (14’02.308S – 127’19.511E) and we had passed the old ketch going the same way. MrJ and I dropped the tinny to motor over to the King George Falls. We were on an expedition to get fresh water as well as have a look around. 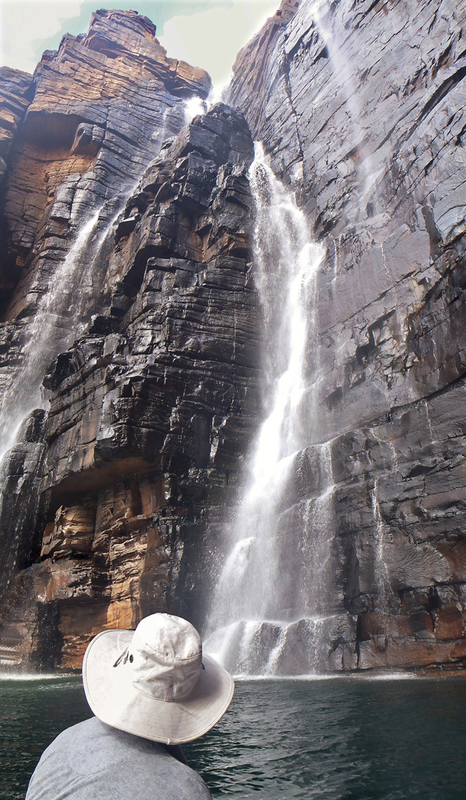 The King George Fall was made up of two 100mt high falls running from one river above, eastern and western separated by a huge jutting out point. The water over both falls was not flowing as much as it has done in the past during a good wet season, more like what happen at the end of the dry season. Just goes to show that this wet season was of very little rain to make the rivers and waterway run like a gusher. MrJ pushes the tinny in close to the rock wall at both falls, close to the spray of the rushing waterfall, too hard and fast for us to collect the water in our small containers (6 x 10ltre bottles). Along the rock wall near the eastern falls there was an opening in the high rock wall, a bit like a roofless cave, which was kept damp by the constant dripping of water over the top and down the fern covered inside back rock wall, dripping into the river off the lower rocks. 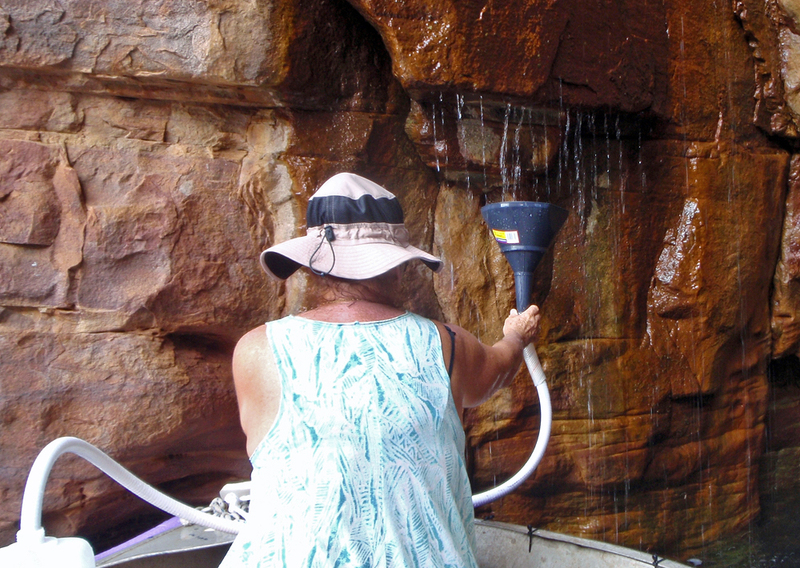 This dripping water was really a running flow from the top, running down the rock face and dripping just fast enough for us to be able to collect fresh water in our containers. I had to sit up the bow of the tinny with a funnel and long hose held up with one hand, the other hand keeping the end of the hose in the water container. I was thinking that I looked like the Statue of Liberty. Hahaha! MrJ had wedged the point of the tinny bow into the rock wall while keeping the stern steady with the use of one of the wooden oars that he had also wedged into a crack in the rock wall on the other side of the opening. That afternoon MrJ and I were lucky enough to be able to have a chat with the fella off the old ketch who had just kayaked back from his climb up to the top of the falls. The ketch, Dharma, was build in Melbourne many years ago and the old fella had bought her in Cairns where he had done a refit (no mod cons) to go sailing. No luck with our fishing! Chilli beans and pasta for dinner while listening to a Pavarotti CD.